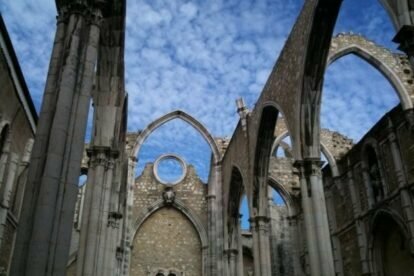 In 1755, Lisbon suffered a huge earthquake. Because of that, only a few medieval buildings survived. One barely survived, but was left exactly as it remained after the destruction, as a symbol of loss and hope. The Carmo Convent, built in 1389, once a gorgeous and unique Gothic church in Lisbon, and nowadays an open air museum, with huge marble columns and stones that contrasts magically with Lisbon blue sky, is the perfect attraction by itself. A very peaceful place, right in the heart of Chiado. It’s a good place to spend some hours visiting, and sometimes I have been there only to read a book or only rest for a while. The important thing is that a visitor, or a local, cannot miss it, not only for the testimonial of Lisbon History, but also for its great archaeological museum, which hosts prehistorical, Roman, medieval and pre-earthquake finds. Even two Peruvian mummy’s are there. Once you enter, you will be enchanted by the view of the nave of the church. I always am! If you are lucky enough, or just an organized person, you can get an open air concert or watch a play in this gorgeous site. Sometimes paid, but most of times free entrance for both spectacle and museum. Last time I was there I attended two wonderful choir concerts for free. It’s a place to go in a sunny day, and once you get there, it’s impossible not to be astounded!